New for 2018: sunroom has new furniture and a window unit AC making it a great separate area for kids or adults, new 50" LCD Smart TV in sunroom, new poly-wood deck furniture, new kitchen supplies (dishes, flatware, glassware, etc. ), and other additions. One of the highest points of view in Duck! Panoramic sound views and great ocean views greet you at The Sandy Peach (formerly known as Pink Sunsets), located in quiet Snow Geese Dunes. This property is just a short walk to the beach access for a full day of fun in the sun. You will enjoy one of the largest pools in the neighborhood! After a full day on the beach, relax in the tree-secluded hot tub on the top deck, or unwind with a good book in the sunroom. The poolside gas grill makes meal preparation a social occasion for the chef! Get the active set together and shoot some hoops at the basketball goal, or take in gorgeous sunsets from the top deck. Take a break in this property cared for by owners that care for your comfort. Top-Level: Great Room with 50" LCD TV, Kitchen with granite counters, Bar seats 4, Dining Table seats 10; Sunroom with 50” LCD Smart TV, Blu-Ray player; Hot Tub, King Master with LCD TV and deck access. Ground-Level: King Master with LCD TV and deck access; King Master with LCD TV; Bedroom with a Duo Bunk/Trundle with LCD TV, shares Jack and Jill Bathroom with Bedroom with Duo Bunk/Trundle. Extras: Private Solar Heated Pool (12x24), Pool Heated Seasonally, Hot Tub (6), Wireless Internet Access, Blu-Ray player, High Chair, Baby Gate, Gas Grill, basketball goal, fish cleaning station, Private community sound access, No Smoking. PETS NOT ALLOWED, Parking: 6 cars. Distance to the Beach: 950 ft.
New for 2018: sunroom has new furniture and a window unit AC making it a great separate area for kids or adults, new 50" LCD Smart TV in sunroom, new poly-wood deck furniture, new kitchen supplies (dishes, flatware, glassware, etc. ), and other additions. New for 2019: Bermuda sod Grass in Front Yard, New Pool Fence, Corn Hole Boards, and New Kitchen Sink One of the highest points of view in Duck! Panoramic sound views and great ocean views greet you at The Sandy Peach (formerly known as Pink Sunsets), located in quiet Snow Geese Dunes. 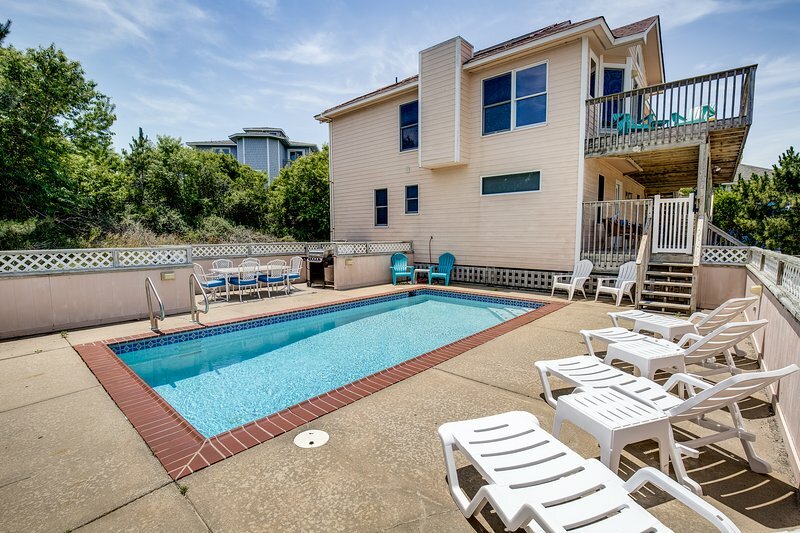 This property is just a short walk to the beach access for a full day of fun in the sun. You will enjoy one of the largest pools in the neighborhood! After a full day on the beach, relax in the tree-secluded hot tub on the top deck, or unwind with a good book in the sunroom. The poolside gas grill makes meal preparation a social occasion for the chef! Get the active set together and shoot some hoops at the basketball goal, or take in gorgeous sunsets from the top deck. Take a break in this property cared for by owners that care for your comfort. Top-Level: Great Room with 50" LCD TV, Kitchen with granite counters, Bar seats 4, Dining Table seats 10; Sunroom with 50” LCD Smart TV, Blu-Ray player; Hot Tub, King Master with LCD TV and deck access. Ground-Level: King Master with LCD TV and deck access; King Master with LCD TV; Bedroom with a Duo Bunk/Trundle with LCD TV, shares Jack and Jill Bathroom with Bedroom with Duo Bunk/Trundle. Extras: Private Solar Heated Pool (12x24), Pool Heated Seasonally, Hot Tub (6), Wireless Internet Access, Blu-Ray player, High Chair, Baby Gate, Gas Grill, basketball goal, fish cleaning station, Private community sound access, No Smoking. PETS NOT ALLOWED, Parking: 6 cars. Distance to the Beach: 950 ft. Additional amenity details: Private pools are open from May 3, 2019 until October 13, 2019. This property is not equipped for pool heat. Pool heat is not an option for this property. Hot tubs are available from March through December. All Outer Banks Blue properties provide bed linens, bath towels, beds made prior to your arrival, and a starter supply of: toilet paper, bathroom soap, paper towels, and dishwater detergent. Discounted H2OBX Water Park tickets available when you book with Outer Banks Blue.